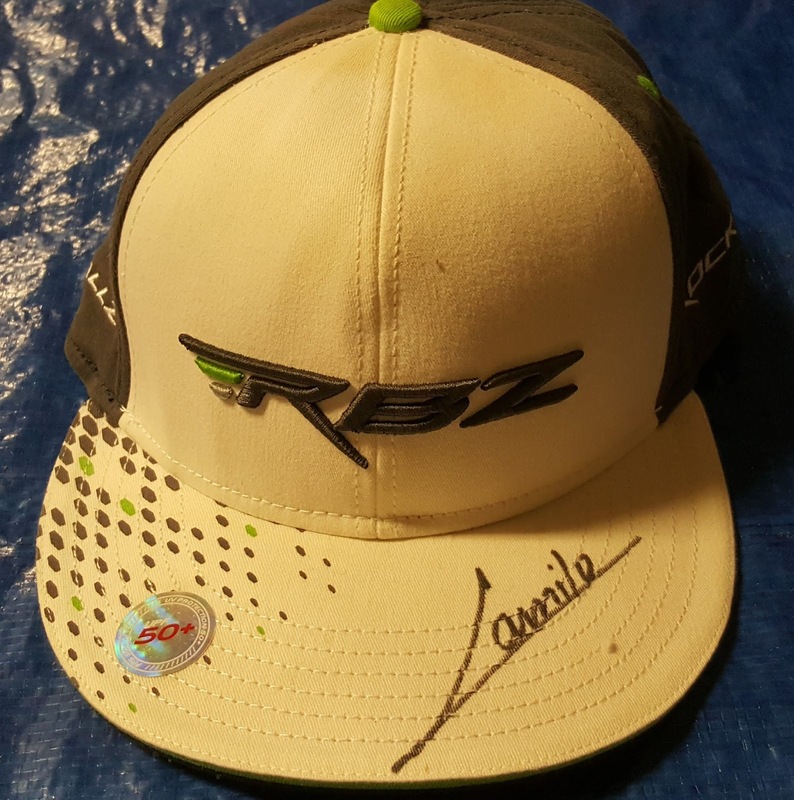 Golf autographs have become big business in the world of memorabilia. From Masters flags to golf shirts, the field is wide open for a sig seeker to snag a possible future greats' name to turn over for a hefty profit. Jordan Spieth, one of golf's young rising stars, as well as past heroes, can command big bucks for their names. Kids usually get first dibs on signatures from the golfers and, according to a Golfworld article, tweens and teens are, surprisingly, in it for the $$$, even more so than adults. According to Sportsmemorabilia.com, a 2015 Masters flag with Jordan Spieth's name penned legibly can fetch more than $4,000. Illegibly, the same Spieth signature is valued at just under $1,500, still a hefty sum. 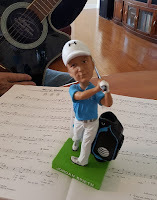 There are two takeaways from this type of autograph hunting - one positive, as assessed by Arnold Palmer, and another more biting sentiment from Brooks Koepka; guess who had the more positive take on the sig seekers? Palmer said of pushy autograph hounds, that these guys have to make a living, too, going so far as to ensure his name was legible on all memorabilia and to mail out his autograph to fans' homes, costing him a small fortune, according to this insightful article. What does Koepka think about pushy autograph seekers? For kids, no problem but for adults...probably not so nice, stating to one fan, "Because I'm not making your money today." Too harsh? Probably. Gone are the days of decorum that made Arnold the memorable superstar he is today. Jordan Spieth's take on penning his name? No problem...most of the time... but kids get first dibs (maybe he should read the article in this blog). Spieth said, "I'm not appreciative of people who travel to benefit off other people's success, I enjoy signing, and sign for kids whenever we get the chance." After reading this article, I have selected a few of my own golfer-signed memorabilia to see what/if it would bring me online riches. 1. 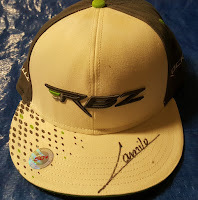 Camilo Villegas autographed RBZ hat. I found a Cobra autographed hat signed by "Spiderman Villegas" but the price was only $29.99...this hat stays on my wall. 2. Keegan Bradley signed golf glove. Although the golf glove I have is in a Srixon envelope, the glove Bradley signed on a Callaway glove is only fetching $69.99 on Ebay. Yet another memory to grace my collection. I also have a golf ball given to me by Annika Sorenstam which says, "Annika Rules" but it is only marked, not signed. Signed "Annika" golf balls fetch about $100 so, we ladies have some work to do in order to catch up with our male counterparts. 4. 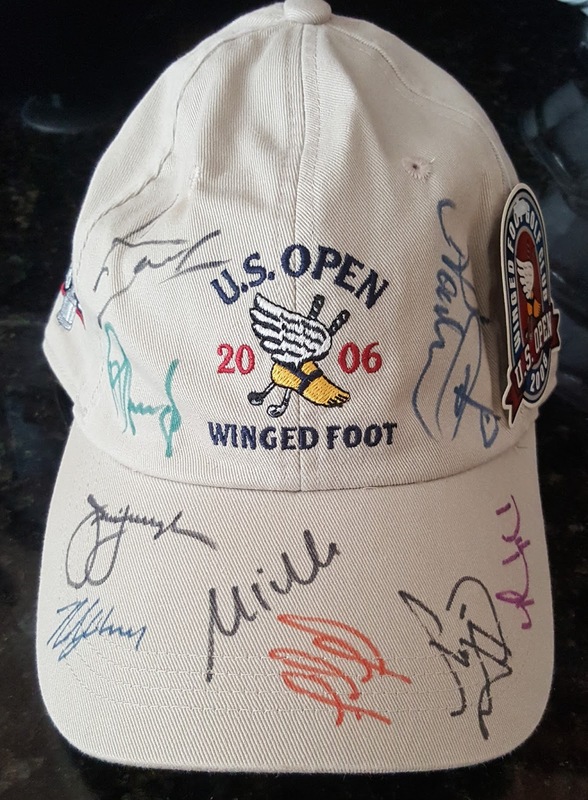 2006 U.S. Open Hat signed by several well-known golfers including Ian Poulter (who drew a green for me) and Fred Funk. I found a similar hat online which is currently on the block for $180. I have not gone out of my way to seek out autographs for my collection...these items were gifted through various means. Which golfer's autograph have you gotten...and how? Tag @Golf4Beginners on Twitter with a photo and comment below on this Golf for Beginners blog. What's News in Golf Technology? Whether it's new or improved, today's golf technology is designed to enhance your game and your viewing experience. Below is a sampling of some of the new tech available today to golfers and how you can use it to your advantage. 1. Go, Go, Go! Can your golf ball fly even farther? Scientists are working with new polymers for the inside of the golf ball and scratch-resistant polyurethane exteriors. Amateurs may one day see their drives easily fly 300 yards - but, what's the fun in that? 2. 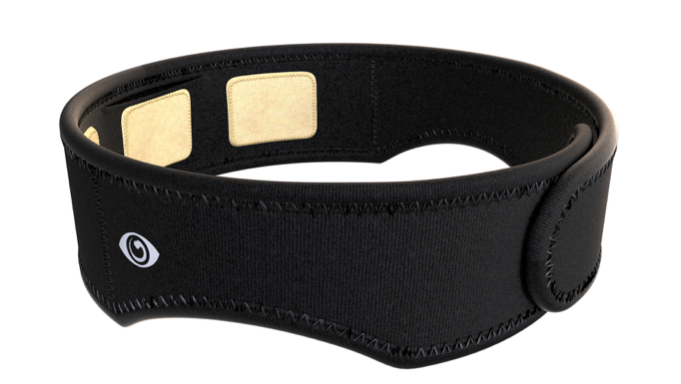 Before I started taking lessons at the Grande Dunes Golf Performance Center, I never heard of FocusBand, a "thought-sensing" neurofeedback headband to help determine how you "feel" before, during and after you hit the ball. You know the Bobby Jones quote, "Golf is a game that is played on a five-inch course - the distance between your ears,"...well, science has come up with a way to make sure that the mental game does not impede the physical one. How focused am I? I will be reviewing this technology shortly and will let you know my levels of focus and tension but, suffice it to say, reading brainwaves to improve your golf game is certainly the "wave" of the future! 4. Although Pro Tracer is not necessarily breakthrough golf technology, it has improved the viewing experience for fans of the game. This U.S. Open received accurate shot-tracking graphics for all eighteen holes along with Toptracer technology which allowed for, "live ball trace over video." How could this design be suited for the average golfer? I am sure someone is already working on it. 5. Now you can play Pebble Beach for real! Okay, maybe not for real but HD Golf states about their simulators, that "from a realism standpoint, it’s as real as you can get — short of getting a tee time at Pebble Beach." HD Golf says they use a geophysical scan, high-res images, and drone footage. I have played Pebble Beach and would like to see if this simulator really makes me feel like I am standing on that 7th tee box, wind blowing in my face, heart pumping to land that golf ball safely on the green. What new golf technology can you add to this list that makes you go WOW? Place your comments into our Golf for Beginners blog below and tag us on Twitter @Golf4Beginners. What Can Video Analysis Do for Your Golf Swing? Scenario: Inconsistency once again rears its ugly head in your golf swing and you chunk, thin it and watch as your shots fly off in all directions. You think this anomaly will solve itself over time but it only gets worse. What is the first step to a cure? A video analysis of your golf swing! Yes, I am guilty of not taking regular golf instruction to keep me on track but, after a recent lesson at the Grande Dunes Golf Performance Center in Myrtle Beach, I realize that my swing won't fix itself. Instructors like Dale Ketola are awesome without using technology to guide them, but their skills are amplified with software such as V1. The software can show a hitch or improper plane angle with front or side views, allowing the teacher to give you the proper method of solving the issue(s). The student also benefits because he or she gets to watch the swing over and over again, with analysis from the teacher. In my previous blog, my video golf lesson using my irons showed that not only was my head in front of the ball but I was turning my body to look at the target, thus pulling my shots. Dale offered me an easy fix which I have been working on at the driving range. Next was an analysis of my driver swing which, I am happy to report, is excellent and right on plane! Even though I swing my driver well, Dale offered me a tip or two to improve my position even further (watch the video below for golf tips of view Rate My Golf Driver Swing on Youtube.com). Don't forget the importance of having a driver fit correctly for your golf swing - if you visit the Myrtle Beach area, ask Dale for help with this as well! Do you regularly take golf lessons? Let us know the benefits you received below, on this golf blog, and tag us on Twitter @Golf4Beginners. Have you been pushing/pulling/chunking your golf shots? Are you out of sync? When was the last time you took a lesson from a qualified professional golf instructor? Chances are you can't remember but, if you can, you probably came away with a much stronger game. I know I did! I knew something was amiss with my golf swing; although my ball contact is good, my shots were inconsistent - left, right, left, right...I was playing military golf! With the latest golf technology at their fingertips, PGA Instructors can identify, show you your flaws and help you to correct them. You will also be able to view the lesson online afterward so, when you hit the driving range, you will remember what you need to practice. Below is a video of my golf swing using an 8-iron. I will place the swing video using my driver in next week's blog but, suffice it to say, Dale had only good things to say about it. I was able to view my swing and Dale compared me with Paula Creamer (and with a similar outfit!) showed me what I was doing wrong and how to correct it right on the screen. If you are guilty of relying on your husband (or buddies) at the driving range to help when you have a problem, "Hey, take a look at me and see what I'm doing wrong", stop NOW and take one of these lessons! 1. Head in front of the ball. 2. Open stance - Turning my body to look at my target. After my lesson with Dale, Barry and I played nine holes at Myrtlewood Pinehills golf course and, guess what! I scored nine shots lower than the previous week...and without even having a chance to practice what I learned! Thanks to Dale Ketola and the Grande Dunes Golf Performance Center for the instruction. After I practice eradicating the swing flaws shown to me, I will be back for another lesson. I hope to try the Focus Band which can tell me my emotional state while I am striking the ball - that should turn up all kinds of issues! Do your golf lessons include visualization with the V1 Software? What other technology do you use to help eradicate swing flaws? Tell us below on our Golf for Beginners blog and tag on Twitter @Golf4Beginners. Female #Golf Athletes - Do You Believe We Have Come a Long Way? In honor of the NCAA Championships and the upcoming Women's Golf Day, Golf for Beginners posts this Q&A about the state of womenin sports from a student working on his final university assessment. Do you believe that equality has finally come to females in sports or is sexism still rearing its ugly head? - How big an interest/fan base do you think there is for women’s golf? I think women's golf is constantly in a state of flux - the more entertainment value, the greater the audience. - Do women’s sports, golf, in particular, need better mainstream media coverage? Always, but not just on traditional sources. We need to reach people where they search. I believe Youtube has much to offer as well as sources that don't necessarily cover golf, such as fitness magazines. The keywords used should reach out to a non-traditional audience. - Generally, do you believe women in sports, and the sports themselves, have come a long way? Of course - take a look at the early days of women's sports...those skirts are floor length! Yes, Title 9 helped with that process (and so did young upstarts like Michelle Wie) but we still have a long way to go. - Are we at a stage where female athletes are recognized as role models to the next generation of women and girls? On the same level as male athletes? To girls that have an interest in sports, I believe more so than male athletes. They can promote physical fitness... strength of mind and body! - Does the media play a fair role in promoting and informing the public of female sporting events and their athletes? No. I believe that women's golf events need to be better promoted. I don't know half of the times/dates of pro events. I would have to go and search out those times although the media is doing an adequate job promoting the NCAA Women's semifinals. - Were events surrounding the vote at Muirfield the start of a change in women’s golf? Or have those events been forgotten about? I think that those events have been forgotten about for now but will be pulled "out of the hat" when they are needed to make a statement. - When discussing the media’s role, do you feel that in a newsroom you are equally represented? Women will be equally represented as they step into the field. There are now more female announcers than ever, and their viewpoints represent a different way of thinking than traditional male questioning. - Are we past the days of ‘body image’ when it comes to women in sport? Or are we still at the height of sexualizing female athletes? Unfortunately, we still need to "sexualize" women athletes to some degree in order to get more attention to the sport but the women in question do it in a very tasteful way. Body image will always be important to the world we live in but, hopefully, it can be balanced with an equally sharp mental state. - Is there pressure for female athletes to look a certain way? In a sport like golf does talent and skill play a bigger role? Female athletes that are "prettier" still get more attention but I believe that their sticks still do the talking! What do you have to add to these questions about women in golf? Comment below in our golf blog and on Twitter @Golf4Beginners.